The past few days have been a whirlwind. One of my relatives is dying. It happened very suddenly; she’s old, she’s been sick for awhile, but it’s still the looming cloud of death, and that’s a tough pill for any living soul to swallow. Nothing puts life in perspective quite like death. I’ve been very emotional. Yesterday, fortunately, I was able to see her, tell her I love her, kiss her goodbye. I could hold it together while I was in the room with her; it was in my car that I broke down. Tears are good. Emotions are the windows to our hearts. I would rather flesh out the state of love and feel this kind of pain than build walls and stay isolated. Humans are meant for companionship; it is in our genetic biology. I’ve been reaching out for support, and the response has been overwhelming. Before, I had the tendency to withhold in order to shoulder everyone else’s pain. Now, I actually feel allowed to admit when I am sad. It’s okay not to be okay. This past week has been an instrumental one. The conference I attended really refined that I’m doing exactly what i’m meant to be doing (therapy), and that there is still so much in store for me regarding what I can achieve and how I can help people. It’s an exciting field, and it’s growing and expanding. I’m entering the workforce, it seems, at just the right time. I’ve also been really getting into meditation. One of the presenters, a world-famous neuroscientist and mindfulness therapist, who developed the wheel of consciousness (Daniel J. Siegel– Google this BOSS of a man), did a live demonstration that allowed me to actually, actually meditate for the first time in my life. I couldn’t even breathe uninterrupted for a minute without becoming restless and agitated before doing this activity. My boyfriend and I have been meditating once or twice a day now, and it’s been absolutely profound in enabling me to get in touch with my senses and appreciate the uniqueness of each passing moment. Now I get why mindfulness is such a thing. Once it clicks, it’s insanely euphoric. Life is insanely unpredictable. With an eating disorder, I realized, I was trying to somehow control that unpredictability. I was trying to keep the world safe and tightly-sealed in my own container, absent of fear, anger, sadness, and insecurity. I didn’t want to be present: it was much too easier to focus and obsess on the future, while dwelling and ruminating on the mistakes shaping my past. I didn’t appreciate small things; I didn’t even really appreciate people. I sure as hell didn’t appreciate myself. What has recovery given me? Appreciation. Appreciation for love in all forms, appreciation for what I get to do every single day, appreciation for the rain that’s currently dancing on my rooftop, appreciation for the teenagers who will be confiding in me in a few hours, appreciation for the feeling of this soft blanket over my skin, appreciation for the ability to type this out right now. To starve worry, you must binge on gratitude. if your past is heavy, let your future be light. Too often we get caught in this stuck image of who who we and what we have done rather than who we will be and what we will do. Imagine if you were able to let go of any negative identity or preconceived notion about your past. Imagine if you could change yourself right now. Imagine if you had that choice. You do have that choice. You have always had it. What do you want for yourself? How can you get there? What do you have control over? What don’t you have control over? Hesitations. Apprehension. Doubt snaking in. We’re afraid to start. Most of us are laced with perfectionism, and, as a result, we fear the risk of failure that presents itself when taking a new path. We stay stagnant. Comfortable with the discomfort. Trapped into routines. Slaves to ruts. Existing in old patterns that no longer serve us, and worse, harm us. We wish for a new future, a wish is merely a dream without a plan. If I focus on who I was, I see a compulsive, overachieving, extremely driven and dedicated person. I see the “perfect” golden child, the one who made everyone proud with her accomplishments and poise. I see the girl who tried her hardest to balance school, work, dating, and friendships, and, of course, tried to be “perfect” in all of those roles. I see exhaustion and fatigue. Anger and avoidance. She was drowning, but the only one who could save her was herself. Food meant everything to me. And when I say everything, I mean it. That control was more important than anything else in my life. I substituted food for love, as most of us do with eating disorders. I substituted control for spontaneity and discipline for forgiveness. I was hard on myself. I accepted nothing and always thought I could do better, be prettier, be more successful. In a sense, I wanted to be anyone but me. I was so wrapped in my own shame that I couldn’t distinguish vulnerability from weakness. And so, I kept my mouth shut, plastered a smile on my face, and learned how to take care of everyone else but myself. If I focus on what I did, I recognize that I maintained a double life. The “perfect one” and the eating-disordered one. The one where everyone thought I had it all, where I looked perfect on paper. Inside, I was crumbling. Food and control dictated everything. 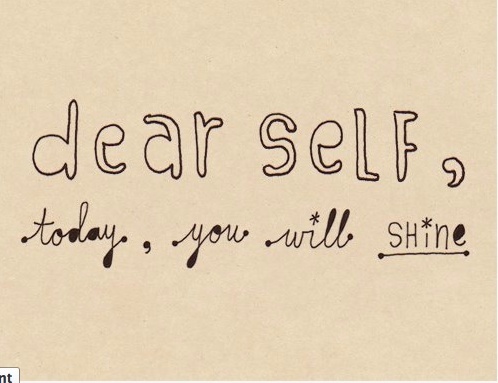 I measured my worth each day by what I weighed, what I eat, and how much I exercised. I was “good” or “bad,” a “success” or a “failure.” And with an eating disorder, you tend to stigmatize yourself far more as a failing, bad person than anything remotely positive. I binged. A lot. I felt great about myself when I could skip meals or push myself to the point of utmost fatigue. I became obsessed with watching the number on the scale fluctuate. If I focus on who I will be, I see someone who is just as kind and compassionate to herself as she is to others. There is a fiery passion and constant zest for life. This is an individual who just feels free and weightless. When the world turns dark on her, she knows how to take care of herself and handle the situation. She can lean on others for support, but, at the end of the day, she is her own biggest fan and her own best friend. She knows when it is okay to feel in control, and when it is okay to surrender. She recognizes that perfectionism does not exist, shame is just poison, and, at any given moment, she has the power and the choice to do whatever she wants. She is not bound by any compulsion, habit, or pattern. She is only guided by her intuition and spirit, and occasionally, by the guidance of those she loves. If I focus on what I will do, I see GREAT THINGS. I see myself giving and receiving tremendous love. I see a constant thirst for adventure and novelty and the willingness to do new things, jump on new opportunities, and seize the moment whenever I can. I see a career full of emotional and spiritual fulfillment for me as well as my clients. I see travel and lots of it. Marriage and children. Charity work. I see a constant lifetime of learning, growing, and expanding. Writing until I no longer can. Reading until I’ve read every book there is. Hiking trails and swimming in oceans. Capturing the world with my written word and a camera. I will do whatever I set my mind to, and my plan will be constantly modified, refined, and changed according to this flow of life. 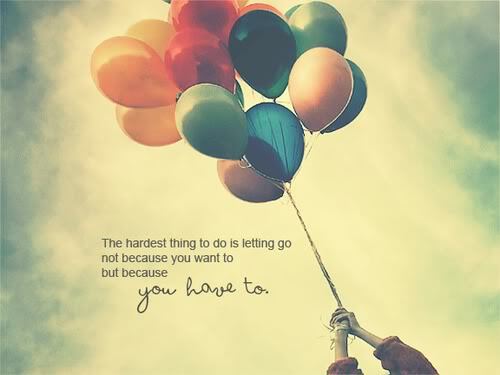 If the past is weighing you down, only YOU have the ability to let go of the weight. Who else is going to do that for you? Who else is going to give you that permission? If you are defining yourself by your mistakes or flaws, only YOU have the power to show yourself in a different light. Seize the day; just don’t let the day seize you. I was blessed to share this gorgeous afternoon with a close friend studying over lunch and coffee and then stumbling upon a random outdoor festival. And over dessert (yes, because in recovery, I can eat dessert without deprivation, overdoing, or remorse), we were talking about total acceptance and the willingness to truly believe that what’s meant to be will happen. I admire this girl. We met in school and became fast friends. We share the same free-spirited energy and positive spirit. She’s currently in a limbo state regarding an old boyfriend who keeps reappearing into her life, and this is hard for her. Of course, it is. She doesn’t know what she wants to do. But, one thing that she said that struck me as beautiful was: I’m keeping my heart open. I’m always keeping my heart open. And this just made me realize, why do we close ourselves to opportunity? Why do we stunt our growth or sabotage our strength? We fear the change, of course. We fear the potential consequences. We want to protect ourselves? But, from what? Pain? Suffering? When it comes down to it, Eleanor Roosevelt said it best when she famously quoted, nobody can make you feel inferior without your consent. We dread this ambiguous unknown, because we grossly believe it will be much worse than whatever state of existence we are living in now. And so we put up walls; we play games with ourselves and others; we resort to deceit and lying; we use excuses; we try our best to stay “safe.” I can sum it up in a way that makes the sense to me: we fear losing control. My friend cannot control whether she and her ex will rekindle. She cannot control the feelings he may or may not have for her. She cannot control if and when she either decides to either hold on or move on. She’s never had this control. Why do we believe it’s ours? We think we can outsmart life? Why do we exert so much exhaustive energy trying to manipulate, contort, and shape life into this predictable storyline with a clear-cut beginning, middle, and end? I embrace the delicious energy of life. Life is indulgence. Life is nurturance. Life is a fabulous ride if we are willing to let go of what comes up ahead. If we are willing to embrace the soul. If we are ready to accept whatever comes our way, knowing that breath can restore us to calmness, faith can bring us to lightness, and peace can bring us to happiness. Of all the changes I have made over the year, mindfulness has been the most important one. Mindfulness, for what it does to my energy. Mindfulness, for what it does to my emotions. Mindfulness, for what it does to the interactions I share. Mindfulness drives the naturalistic personality of a child. As the ego takes over with its dictating logic and alleged common sense, we lose the ability to relish the present. It is a conscious choice to take that moment back. It is a habit that must be practiced. It is a desire that must be wanted. I realize that I have been starving for growth, for this all-knowing understanding, for pure self-actualization. My impatience signifies desperation, but it also embodies my unwillingness to let go and surrender and accept that I am where I need to be right now. 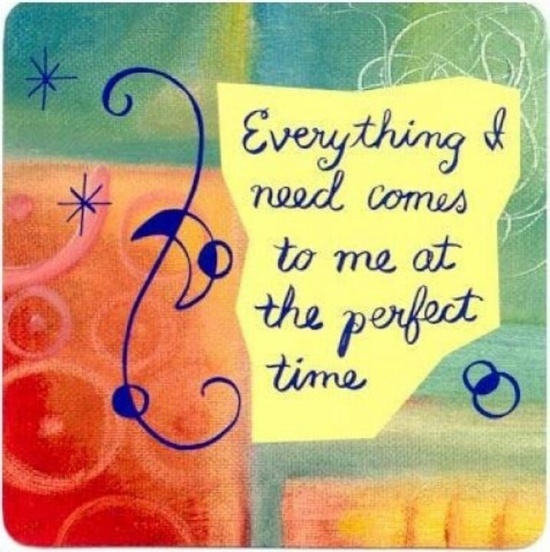 I must accept everything will come to me at the perfect time…when I need it, even if that is not necessarily when I want it. I am growing. I have to remember that. Every single day, I am growing, because anytime I step out of my “safe” comfort zone, I am stretching myself into new horizons. Spiritually, I am learning how to become a more wholesome and intuitive person, bound less by compulsion and preoccupation as I strive towards a greater sense of my own balance, as I learn how to achieve serenity. I don’t even know what true spirituality means, but I’m embracing it for the very first time in my life. They say with relapse in any addiction or compulsive behavior, rather than condemn yourself, it’s important to accept this idea of “redoubling the spiritual activities.” I suppose this resonates with me because it has essentially been a foreign and absent concept for my entire life. I never grew up with any God foundation; never grew up praying; never grew up believing that “everything happens for a reason.” I was taught that you essentially control your own destiny, that you need to push and preserve in order to get what you want. I am unlearning some of that. I do believe we make our own destiny, but I am learning that the universe will take care of me…that there is so much I DON’T have control or responsibility over, that I have spent a lifetime dwelling and obsessing over things that were absolutely and completely out of my hands. This takes patience. It also takes a willingness to surrender my stubborn mindset. What I have been doing for years has not been working. Do I need to beat myself up over that? No. Do I consider those years as wasted time? Never. Do I need to hate myself for anytime I engaged in my eating disorder. Absolutely not. Everything has been a learning lesson. Everything has taken me to the path I am today. I am happy with who I am, passionate with what I do, and excited for what lies ahead. Recovery can be so exhaustive, but these moments of clarity keep me motivated and inspired to keep going. I know I am on the right track. I know I am going at my own personal right pace. I know that everything is going to be okay, because I trust myself and I trust the universe this time around. And I can accept that not all my problems will be solved at once, because I have finally learned after years of struggling that my issues are not SOLELY because of my eating disorder. Even if I woke up fully recovered tomorrow, my life would not just be this “perfect” world I envisioned. My eating disorder is a symptom of deep underlying thoughts and feelings…my eating disorder is simply the behaviors manifesting from those. At first, I found this incredibly discouraging. That’s why I think relapse relates are SO high. You expect to instantly feel better once you stop engaging in these behaviors, but nope, oftentimes it feels WORSE. Because unless you challenge those distorted thoughts and learn to POSITIVELY cope with those uncomfortable feelings, you’re just another dry drunk. That is why anytime I hear people complaining about the amount of food or type of food they consumed, I just want to shake them up and down and say, IT’S NOT ABOUT THAT! It was never about the food when we developed this disorder, and it won’t be about the food when we recover from it. I’m baaaaaack into the real world and my happy getaway was MUCH NEEDED. Sunshine, drinks, my friends, dancing, and shameless nights were shared by all. I do love Vegas. And I love being a young, single girl in Vegas. And so, things have turned around for me. Something really clicked on Monday night when I wrote that long letter of forgiveness to myself. I have realized that just because I spent a long time hurting myself in various ways does not mean I am a bad person. It does not even mean I necessarily did anything wrong. As my therapist once told me, you haven’t killed anyone. You aren’t a wanted felon. You don’t need to act like you are. If there are people who can forgive murderers and felons, I can forgive myself for any wrongdoings I may have done to myself. I had a really good time over the past few days and I felt so happy and carefree, which are two feelings I haven’t experienced in awhile. I know that vacation mode isn’t necessarily reality, but at the same time, I was with all girls and spent the majority of my time in either my bikini or a tight club dress, which could have drawn out some heightened insecurity. But it didn’t. I felt beautiful the entire trip and that’s a good feeling to have! Another thing I have noticed over the past few months: I am becoming more assertive and caring less about what people think of me. For someone with deeply-rooted people-pleasing tendencies, any time I express my own opinion, even if it is against the majority rule, I feel empowered. On this trip, I definitely noticed that I felt very comfortable in asserting my own needs and standing up for them if necessary. And how was the food situation? The best word I can use to describe it is normal. I ate delicious and real food, drank (too much) alcohol, and let myself engage in some drunk munchies. How do I know it was normal? Because even when I felt like I may have been eating too much, I could finally use the comparison game to my advantage. I was eating similarly to my friends and we were on vacation so everyone was indulging. They didn’t beat themselves up, so neither did I. I may have to remind myself that indulgence can be encouraged and it doesn’t have to lead to the desire to binge or restrict, but that’s okay. I don’t mind reminding myself that. I may have eaten more “unhealthy” food than I am normally comfortable with, but that’s also a normal thing to do on vacation. Eating disorders aren’t about the content, type, or amount of food. They’re about the thoughts, feelings, attitudes, and behaviors around the food. And so now, I’m going to take it easy! Peace out everyone. Sometimes, it’s depressing knowing that everyone has faith in me. My family, my friends, my therapist, my sponsor, most of the awesome support I get from this blog. And I’d be lying if I said I didn’t have faith in myself. Most of the time. Some days, I feel much more confident on this blind faith thing than others. And to be honest, part of me wonders, if all these extraordinary people have faith in me, that means I must be doing a good job. So why then do I feel like I keep screwing it all up? Why has the bingeing not completely stopped? Why do I still listen to you above all these (far more rational, intelligent, and kinder) people? Recovery is hard for someone who likes structure, who likes the concise and definite, who needs a clear-cut plan in order to feel safe. Recovery is hard for someone who always knows what lies ahead of them, because with recovery, that guarantee is not there. Recovery requires letting go of that need to to control and embracing life for what it is–spontaneity, fear, unpredictable turns and all. We can reflect on a particular experience and tag it a turning point. However, neither a lone prescription nor a single martini opened the door we passed through when we chose recovery. But they each may have played a part, and it’s the many parts of our lives, past and present, that guarantee us the turning points that nudge us further up the mountain. We will see the summit. And we will understand how, each time we stumbled, new strength was gained (Each Day a New Beginning). This is exactly what I needed to read. As a former long-distance runner, I usually use the marathon metaphor to compare my recovery journey to the long and tumulus 26.2 mile feat. But I am also an avid hiker, so this comparison works just as well. I feel like I have reached many turning points and milestones within just the past year. Deciding to seek professional help: that was a turning point. Deciding to walk into OA for the first time: that was a turning point. Deciding to make my private journal public for the world to see: that was a turning point. Each experience disclosing my eating disorder to someone important in my life: those have all been turning points. Even my behaviors have been turning points. Every binge teaches me something new, and even though it is so hard not to, I really don’t regret any of them. I know true recovery will happen when I fully and really feel ready for it, and maybe I am not 100% there. Maybe I’m still hovering onto that last itty-bitty part of “needing” my sickness. I have to be gentle with myself and accept where I am today. Every moment is a new chance to do something positive for my life. Rather than looking in the review mirror at all my past mistakes or worrying about the obstacles lying ahead, I know that I need to just embrace what I have right now. For right now, I can consider myself strong in recovery. For right now, I can consider myself wholesome and deserving of love and kindness. Giving myself recovery is like spoiling myself with the best gift in the world! Easy, right?! Sounds like a no-brainer. Except, I do not usually spoil myself. How can I do that, when I am so naturally hard on myself?! I spoil others, but I tend to be cheap and stingy with myself. I need to unravel that attitude and challenge it! Because if I don’t spoil myself, who else is supposed to?! I once put that pressure on other people (family members, boyfriends, friends), but I know at the end of the day, that is MY job. I want to spoil myself. I want to be worthy of that love and self-respect. I deserve it. Recovery is not store-bought or packaged with an instruction manual; recovery is not something one can wrap in a pretty box and give to me on my on a special occasion; recovery does not carry an expiration date; recovery is one-of-a-kind because nobody else will have the exact same one as me; recovery is sitting there, waiting for me to tear off all the paper and bows and just open and hold it; recovery is something I know I want, even if I don’t know how it will change me.